My old PC broke!!!! And I wanted to have a party in my blog on Friday… some of the things I need are in the PC and don’t know if it will be fixed before Friday… Imagine snakes, skulls and pigs coming out of my mouth! I’ll try to come up with a solution… I hope! You all know by now that I’m getting kind of fried here! The weather is humit and hot and I just cannot find enough ways to avoid the heat. The kitchen is Red Inferno these days and I only feel comfortable when I open the fridge! So, it feels great to “cook” something without using the stove and thanks to this months’ Joust ingredients here you have a F.R.E.S.H. dish in capital letters! Flavourful, Raw, Eadible any time, Simple and Healthy. Mr. Kalofagas has chosen the best ingredients for me this month! Thank you darling Peter :D. Eventhough, this is my first time with sesame and coriander there’s been no problem at all in using them and I’m thinking of adding these two new condiments to my dishes :D.
Now, this dish might look a bit Asian, but I got inspired in a Spanish Cooking Magazine… well it must be globalization… anyway, it’s so fresh and easy that you should all try it! 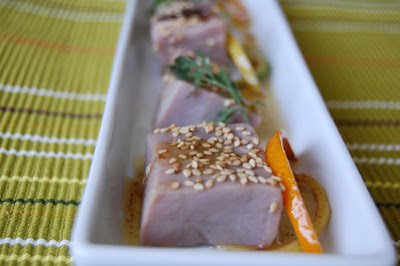 Ingredients for 4 servings: 600 grs of SuperFresh Tuna, 1 fresh lime, 1 fresh lemon, 1 fresh orange, some toasted sesame seeds, 4 extra virgin olive oil tablespoons, thick sea salt, 2 tablespoons of soya sauce, some fresh coriander springs, black ground pepper. To avoid fresh fish parasits, first freeze the tuna! Ask your fishmonger to clean and cut the tuna in dices and take away the fat and skin. When you get home, wash under tap water and place over kitchen paper to leave there all its blood. Meanwhile, get the citrics juice. Strain and reserve. Cut half the skin of the fruits in long strips and take away their white part because that could turn the dish bitter (the lime was really hard… I did what I could). Place the tuna dices in a big bowl and pour the citrics juice on top. Take half of the citrics skin’s strips and pour inside the bowl too. Add some salt and pepper and reserve in the fridge for 20 minutes. After 10 minutes have passed turn the tuna so that it gets the citrics marination all over. Wash and dry the coriander springs. Reserve. Prepare a vinagrette with the olive oil and soya sauce, some coriander leaves, a bit of salt and pepper. Stir and add the other half of citric’s skin. Let it cool down in the fridge. 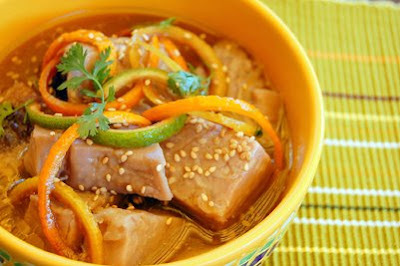 1st.- Strain the tuna dices and place in a long dish, sprinkle some sesame seeds on top and dress with the vinagrette sauce. Decorate with some citrics skin and coriander leaves. 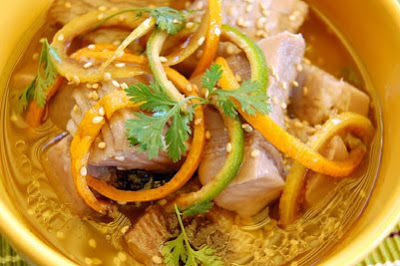 2nd.- Strain the tuna dices and place in a new bowl. Mix half the citrics juice with the vinagrette, stir and pour on top of the tuna. Sprinkle with the sesame seeds and decorate with citrics skin and coriander leaves. Nuria this is excellent! 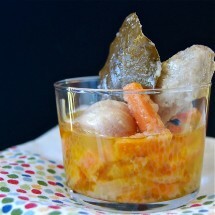 I love how you have applied the Joust ingredients…the tuna looks so fresh and full of “summer”…bravo and buena suerte. Sorry about your PC – hope all works out! I was looking forward to your party! this would be so good, it’s so hot around here and i don’t want anything heavy. Nuria, I can relate to how hot the kitchen gets…it’s the same in Greece. I’m glad you met the challenge of the 3 ingredients I chose for the Joust. You dish is a celebration of tuna and the three ingredients…you are a diverse cook! You are so sweet Laurie! I can feel your good thoughts already getting here :D. I hope I can get my data back!!!! It’s part of my life! Hola Peter :D. Thanks boy! I feel flattered! Thank you for the mention Nuria but I must say there are some extraordinary dishes in the Joust Nuria…including yours which make it a tough decision. It is just so much fun to particpate and come up with something!!!! oh nuria, i am totally with you on cooking in the heat. in fact, only about an hour ago I had a breakdown in my kitchen! I was making pasta and i didn’t have enough hot water and i was sweating so bad from the heat that i got so mad and flustered i started screaming at the pasta and had to go outside to ‘cool down’ for a few moments! I think you’ve got a great chance to win the joust with this one! and you can’t get any simpler with a recipe!! great job. I’d happily send you some of our cool weather… too bad about your PC… Mine is having problems, too… I’m hoping it hangs in for awhile longer. Lovely tuna… and the Ajo Blanco…. Yum!!!! Can I have them together, please? You are so right Val! Participating is wonderful… but winning must be toooooooo much!!!! Amy, your describtion of one of your brightest moments… made me laugh, I could nearly see you :D. I bet that the heat you get in N.Y. and the one here are very similar. Thanks for your encouraging words, sweetheart! You can have ración doble, darling! Congrats, Nuria, on placing in the Joust! Oh, Nuria, this looks absolutely fantastic! I was out of town when you posted – so sorry to be late. I hope your pc situation is solved soon!